appe mould recipes collection. Appe is a popular South-Indian snack made from a batter of rice and pulses, semolina or may be any type of flour. They are cooked in Appe moulds (Appapatra/ Appam Patra). The appe mould is a shallow pan with round, cup-like holes to pour the batter into. While traditional appe moulds are made of iron, stoneware or bronze, we now find most households replacing these with non-stick appe moulds, which are readily available in stores. This utensil is used on the stove-top to cook appe. They are small, round and a perfect accompaniment to your cup of Masala Chai or South Indian Filter Coffee. Appe is usually cooked in oil and are crispy on the outside and soft in the inside. Some batters require fermenting while others are quick. In fact, if you have leftover idli batter post last night’s dinner, you can use it to whip up delectable Quick Vegetable Appe. You can pack them in your kid’s tiffin box along with ketchup. 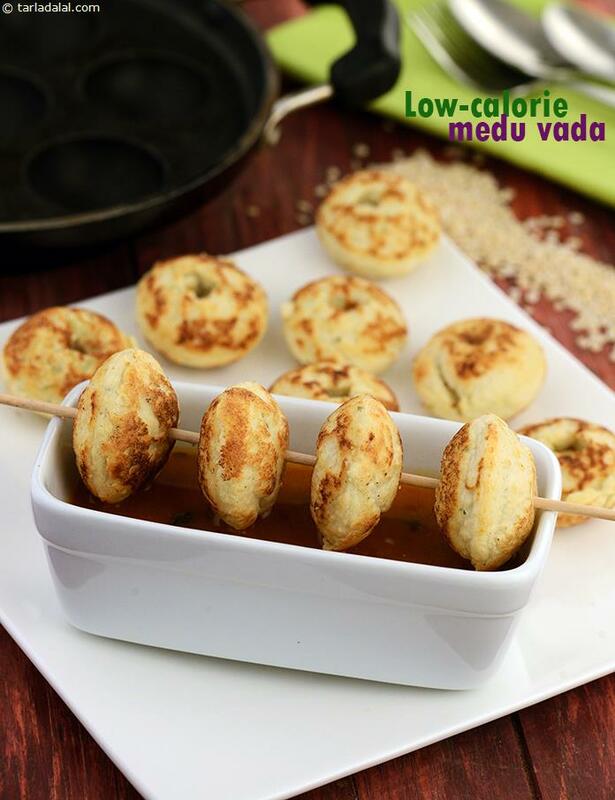 While kids can enjoy these simple appe, adults can perk up the idli batter with spices to make Masala Appe. Serve these tasty snacks with accompaniments like sambhar and coconut chutney. An addition of the traditional South-Indian tempering of mustard seeds, urad dal and curry leaves, enhances the batter and helps in making a variety of appe, such as the Instant Rava Appe and Rice Appe. Enjoy our collection of Appe Mould Recipes and other Equipment Recipes below. Using non stick appe mould makes life easy and healthy. Due to its colour and dainty round petite shape, kids are tempted to pick up this healthy snack. Sabudana wada is a highly addictive snack. Here is a healthy alternative to it which is equally tasty.